These full radius steel bungs are 1" long x 3/4" diameter and are 3/8"-16 thread. 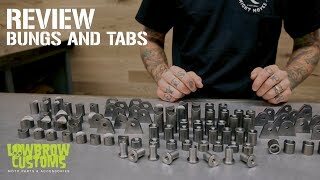 Made from 1018 cold rolled steel, they are easy to weld and are a great bung for blind threaded items like fender mounts or struts or anything else you can think of. Perfect for the home builder or pro. The only bungs I use for any of my builds. You can't go wrong with anything Lowbrow sells. Makes for a very strong and clean looking fender strut attach point. Large surface area allows for easy welding to. High quality, weld nice and priced right! !